Safety demon-strations are required before take-off. FOR many young people, especially those who love travelling, the job of a flight attendant presents an opportunity to visit different countries and see various places of interest. Better still, the job not only entails free globe-trotting but comes with a salary as well. There are, of course, people who are not attracted by such prospects, perhaps thinking flight attendants are mere waiters or waitresses on board an airliner. Actually, the duties and responsibilities of flight attendants (also known as air stewards or stewardesses, cabin crew, cabin attendants, or air hosts or hostesses) go far beyond just serving food and drinks to passengers. Their first and foremost responsibility is safety of the aircraft cabin and its passengers. So serving meals is the least of their roles. The crew members must be ever ready to switch functions – from catering to caring for the safety of passengers as and when the need arises. To passengers, flight attendants are the most visible and intimate personnel of the airline industry. Generally, they are the ones spending the most time attending to passengers compared to other airline staff. What is even more challenging is that they have to remain courteous and pleasant at all times as part of the quality service they are expected to provide. For a peek into the lives flight attendants, thesundaypost spoke to four of them. Their service with airlines ranges from one to 13 years. The most senior among them is Anson Voon with 13 years’ experience in commercial aviation under his belt. He is also a trainer for the ‘Flight Attendant Preparatory Course’. 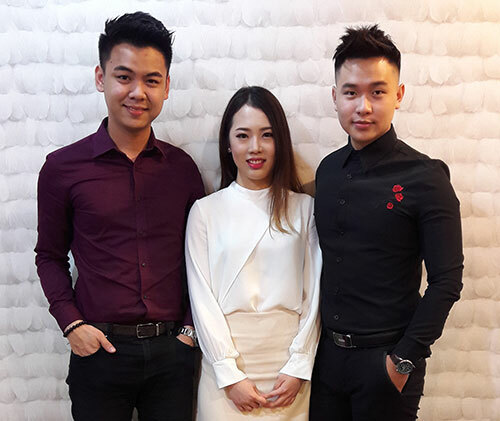 The other three are Jasmine Pau with three years’ experience as a flight attendant, Kingston Neo (two years plus), and Shannon Phang (one year). According to Voon, there is a ladder of success for a flight attendant to climb – from a regular cabin crew member to a senior crew member and eventually, an instructor. Moreover, there is always the opportunity to move from one airline company to another. This movement is usually from the smaller to the larger and more widely known company. According to Pau, the job of a flight attendant requires multitasking. He or she must be ready to react quickly and intelligently to any situation. In other words, flight attendants have to always find solutions to problems within their capability to solve – as quickly as possible. Neo chipped in to say a person interested in becoming a flight attendant most probably has a spirit of adventure. He started his cabin crew career at 19, leaving family and home and soon finding himself flying to cities with different cultures, languages and customs. “It has been quite a thrilling time for me, and, yes, the best thing is I get to do all these exciting adventures while I’m still young, energetic, and enthusiastic,” he said. 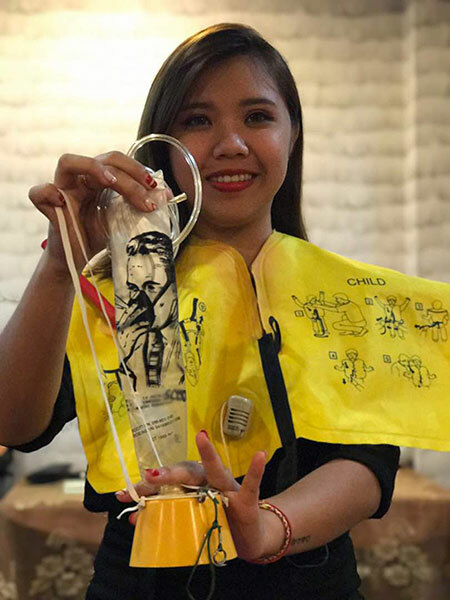 Phang, meanwhile, suggested that besides training in inter-personal skills, flight attendants needed to continue developing these skills through interacting with all kinds of people. Phang said he would try to be nice to people who weren’t “so nice to him”. A tolerant attitude, he noted, has helped him greatly in his job. In fact, he found he could also apply such good-natured mien to other areas of his life. “By the way, a flight attendant’s job isn’t as hard as perceived. Actually, it’s pretty straightforward once you’re learned the ropes. It comes with a good income too,” he added. Flight attendants do more than just serving food and beve-rages. Phang said although the salary and benefits were good, being an air steward had been his childhood dream all along. When he was little, he always admired the winsome demeanour of flight attendants who “are so handsome, beautiful and elegant, always smiling and helpful”. Back then, he said to himself he would join them one day. His dream has come true. Phang recalled after finishing school, he immediately looked for opportunities to get into a job as a flight attendant. Although supportive of his career choice, his parents were reluctant at first, thinking the job was a bit risky. But he managed to win them over by reasoning that “no job is totally free from risks”. Phang, who is based in KL, said he has no regrets over his choice of profession because it has given him the opportunity to see a lot of places, do a lot of things and meet many people. He said that suits him because he is, by nature, a very outgoing person. As for Pau, the thought of becoming an air stewardess never occurred to her. One day, she randomly joined a flight attendant preparatory course and found she liked it. So when vacancies for the post of air stewardess came up, she tried her luck by applying for it, was called for an interview and found herself working on board an airliner sooner than she ever imagined. However, she confessed her family did not quite agree with her line of work because it has no fixed working hours. They had preferred she took up an office job. Pau is happy with her job. She has been flying since 17, saying she now feels proud to be as an ambassadress of her airline company. Neo, who left school after Sijil Pelajaran Malaysia, said he was hunting for a job and finding it tough getting one with the right pay. Since he loves travelling, the idea of working on board an airliner appealed to him. “Why not give it a try while I am still young?” he asked himself. Initially, his family objected partly because of the air disasters they had read about. But Neo explained to them that statistically, travelling by air is much safer than travelling on land and in that respect, safety was the least of their concern for him. He said he felt lucky to have been selected as there were many applicants eyeing the same job. He was told in Thailand or the Philippines, there could be more than 2,000 applicants chasing a handful of vacancies for the job of flight attendant. Voon, meanwhile, said from experience, being a flight attendant could be quite “demanding physically and emotionally” at times. He said cabin crews are expected to handle passengers with diplomacy at all times, regardless of their own mental state, especially after being on their feet for long hours and sometimes, suffering from the effects of changing time zones. According to him, all these challenges were clearly spelt out during the training course, covering, among others, topics on safety procedures, legal-immigration matters and customer service. He pointed out that the important attributes of a flight attendant are good communication and interpersonal skills, composure during emergencies or when dealing with difficult passengers, tact, and, of course, good health and fitness. The ability to swim is a requirement of many airlines. Swimming lessons are given and after knowing how to swim, the next thing the cabin staff have to learn is rescuing people. The swimming lessons take about three months and trainees will be given a certificate. Other must-have papers are the English aviation certificate and the fire drill certificate. Flight attendants must also know airline abbreviations and definitions, federal aviation regulations, 24-hour clock (military time), time calculation, 60 predominant city codes, decompression and First Aid, comprehensive customer service proficiency, food and beverage service and even aggression management. (From left) Neo, Pau and Phang. Neo said the most common misperception about flight attendants is that they are waiters and waitresses working on board a plane. He felt this could be due to serving meals being the most visible of their duties in which they interacted directly with passengers. He said there were other responsibilities such as looking after the security, safety and comfort of passengers. The cabin crew must also know basic first aid, firefighting, evacuation of passengers and even handling unruly passengers. “In fact, I dare say our main role is as ‘safety officers’ – which is why you always see us demonstrating safety procedures before take-off,” Neo noted. Some people think only those not highly educated become flight attendants. “This is untrue,” Phang said, adding that many of his senior colleagues are degree holders while some are professionals. There is also the misperception that flight attendants are responsible for placing the passengers’ bags or luggage into the overhead compartments. Neo clarified they were not obliged to do that but could assist in certain situations. Some think for female flight attendants, the higher their hair humps, the more senior their ranks. Pau said this is not true – it’s just that the cabin crew have to be well-groomed and the women’s hairstyles have to be very neat. There are people who think male flight attendants are required to use some make-up. According to Phang, the airline he works for does not allow the men to wear any make-up but he believes it depends on the rules of each airline. Voon pointed out that although there are no blanket rulings on make-up for the men, oily skin had to be treated and dark circles around eyes concealed regardless of gender. He said the airline he works for focused more on professionalism than looks. “This is a job that requires professionalism. It’s like a flight attendant having to double up as a safety officer, rescue personnel, a firefighter, a nurse, a hospitality provider or even a psychologist all rolled in one. Voon also said there is no fixed working age limit for a flight attendant. Some think cabin crew are allowed to work only a few years, then replaced but there is no such rule, he pointed out. He added that as long as one is still fit and healthy, one could continue to work, adding that in the airline he works for, male and female crew members could work until 56 and up to 50 respectively. As for physical build, Voon said this also depends on individual airlines. Neo, Phang, and Pau debunked the myth that flight attendants were immoral and often had illicit relationships with pilots, colleagues or even passengers. The trio believe such an image was created by a few rotten apples. “Yes, we do go out with fellow crew members from local and international flights and maybe sometimes with passengers. We’re just like other people who need some time to unwind but that doesn’t mean we don’t have self-respect,” said Neo. Asked if they had any unforgettable on-the-job experiences to share, Phang, the first to reply, said he still had a warm feeling whenever he remembers receiving a complimentary letter from a passenger whom he helped during medical emergency. Seeing the passenger had breathing difficulties, he quickly leaped into action by applying what he learned during the training. It saved the passenger’s life. The passenger later wrote a thank you letter to the airline company and that was enough to make Phang feel appreciated. 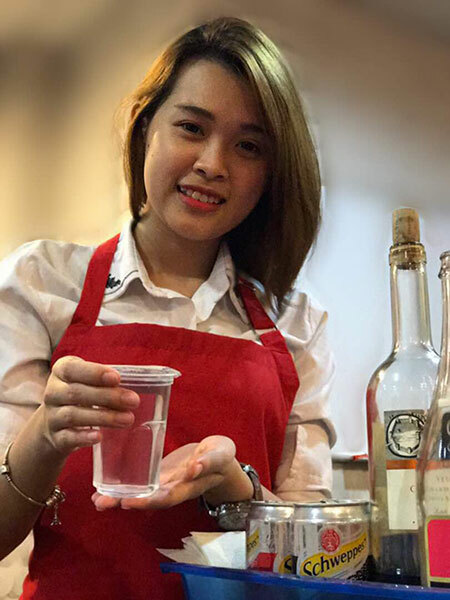 Relating her own experience Pau said two years ago, during a flight from Johor Bahru to Kuala Lumpur, a passenger had an epileptic seizure. She and the crew members sprang into action, putting to use all the skills they learned from their training. They were also lucky to have three doctors on board. The passenger was duly attended to and saved. That’s Pau’s fondest memory in her three years with the airline. There have been unpleasant encounters as well. Her response was a clear hands-off and continuing to go about her work professionally. So far, she has not encountered any case warranting an official complaint. For Neo, the toughest challenge as junior employee was working under overly strict senior colleagues. He said they could be from countries like Korea, Japan, Indonesia or Thailand and some of the senior staff among them did not have a friendly attitude towards their junior co-workers, especially the newcomers. However, he acknowledged that “in a way, that’s good because the seniors’ strictness keeps the juniors on their toes. We have to learn fast and to be resilient”. For Voon, one medical emergency he attended to is an unforgettable experience. A passenger who was going for an operation, fell unconscious due to cardiac arrest. He was the first to respond by applying CPR on the passenger. The problem was that this particular situation turned out to be different. The automatic external defibrillator (AED) for restoring the heartbeat to its normal rhythm, could not work properly because the passenger had a hairy chest. Voon had to shave the passenger’s chest before sticking the device onto it. The passenger still could not be saved and he was traumatised by the incident. Pau revealed she had come across unusual requests from passengers. Citing an example, she said some passengers had asked for cotton buds, ear plugs or toys, and titbits for children, which the crew could not provide. Voon once turned down a passenger’s request but managed to give it a pleasant ending. He said the passenger had asked if he could have some bubble tea. Voon told him politely the item was not on the flight menu. Voon said the passenger did not feel offended but burst out laughing instead. He said some passengers asked if they could have their food or drinks chilled because they thought there was a fridge on board. The cold drinks served are actually chilled by dry ice. As for Neo, he was once approached by a passenger who, out of curiosity, wanted to have a look at the flight attendant’s rest chamber. He told the passenger such a facility was only available on bigger aircraft flying long haul between 14 to 16 hours in a stretch. Next Article Don’t take these bulls by their horns!